I thought I would share the hats that my daughter and I made for our friend who is pregnant with a little girl. We met her and her family through youth football, and we can’t wait to meet her little baby girl. We received a box full of goodies from Bailee and her mom, Bonnie from Auberry, California. We are so delighted to have new friends making hats and contributing to Knitting Rays of Hope. About a year ago, I was on the internet looking for an organization that my mom and I could donate our hats to and when I found the Knitting Rays of Hope website, I knew I wanted to send our hats to you! My mom and I have been making these hats since last summer and praying that the people who receive these hats will feel the love that these hats were made with. I love what you guys are doing and I look forward to sending more of our hats to you! We are so grateful that Bailee’s web search led her to us, and we can’t wait to see what they send to us next! As you may already know, we are huge football fans. Though the football season is almost done, I’d say this has been an interesting season. After many years of begging, we finally caved and allowed my son play youth tackle football, which he loved. He did fairly well, getting exposed to all different positions and found he likes quarterback the best. His team made it to the 1st round playoffs and he was nominated to play in the All Stars Game. We just had his banquet and he received a patch for being a “Scholarly Athlete”, which meant maintaining a 3.0 or higher during the football season. I was actually surprised that it was only 3.0 GPA and only 5 boys out of the team received this. But nonetheless, we are proud. I made these hats for fellow football fans, 2 hats for children and 1 hat for a baby in the NICU, over the break, while watching the Ducks win the Rose Bowl and our Steelers lose in the playoffs to the Ravens. Since our Steelers are out, we might quietly cheer for the Seattle Seahawks to win Superbowl. I don’t know why the Seahawks, we normally are true blue Steeler Fans, not rooting for anyone else. Perhaps it’s because Russell Wilson is my son’s doppelganger. But we certainly don’t cheer for the Seahawks as loudly as we do for our Steelers! After looking in my yarn stash and having the desire to whip out something special, my daughter made a football hat for a young chemo warrior. She commented that we have made football hats before, but most of them were little for babies in the NICU. Being a huge football fan herself, she wanted to make a football hat for another kid who loves football. I use Jeannie Phillips method of closing the hat, as it creates a rounded, less bunchy top. You knit 2 pegs, then purl 2 pegs for 3 rows. Go around and remove all the knit stitches from the loom and close by making a cross (sew the yarn in a + at the top of the stitches) and then go in through the top of the hat. Make a knot inside the hat and cut off the excess yarn. Sew the finger laces on the front of the hat with a white yarn, using a tapestry needle. You may have a tail near the brim. You can make sure to secure it with a knot, very close to the brim and cut off the excess yarn. 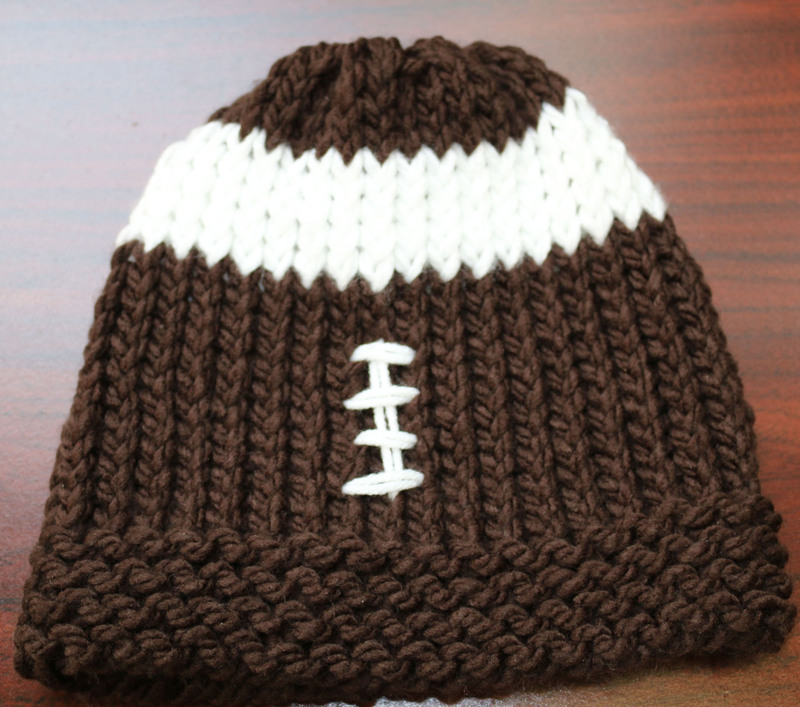 I hope that you enjoy this pattern and can begin to make football hats for all the football fans in your life! We have been busy trying to get all of the shipments ready for December’s delivery. 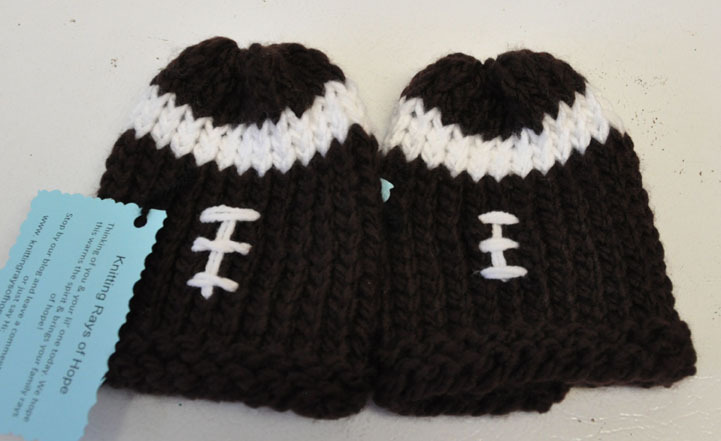 Here are 2 football hats for babies in the NICU. These were so easy to make and I really like how soft this yarn is (Charisma). Hoping football families love seeing their lil’ ones in these football hats! Go Team! We are trying to get a package ready to be shipped to a military hospital based in Japan as a special request. 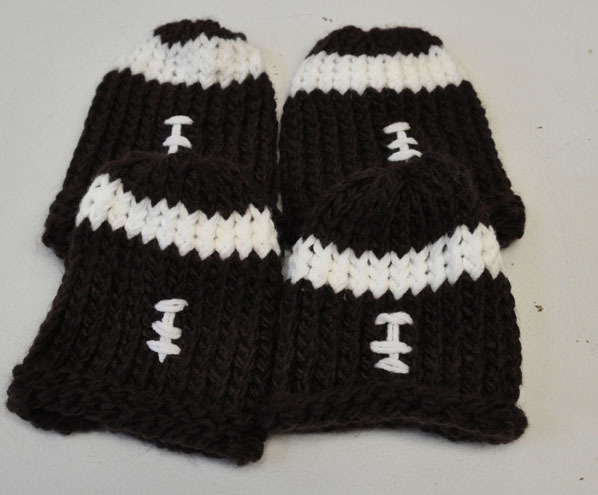 Along with the holiday themed hats, we will include these 4 football hats for babies in the NICU. Our service men and women deserve so much respect, as they make sacrifices daily to protect our freedoms! I hope they look at the football hats and feel a little piece of home is with them while they are across the ocean.